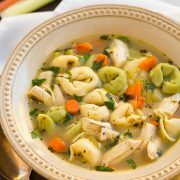 Are you searching for an extraordinary chicken noodle soup recipe? Then your search ends here =). 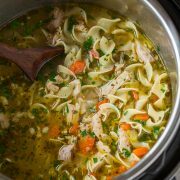 This chicken noodle soup is perfectly spiced with a hint of ground nutmeg and thyme, and it bursts with fresh flavor from the fresh parsley, vegetables and lemon juice. 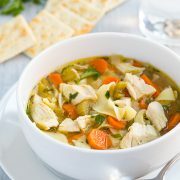 This is my favorite chicken noodle soup recipe! It is wonderful year round but especially on cold fall and winter days. This soup is delicious garnished with freshly grated Parmesan or Romano cheese. It just adds that extra hit of flavor which surprising compliments this soup so well. The cheese is optional so feel free to leave it out if you don’t have it. Also, if you have a preferred alternate method for cooking the chicken feel free to cook it your own way. I nearly always prefer to slow cook my chicken because it basically guarantees tender chicken (you know, the kind you can cut with a fork or spoon =). A perfect accompaniment to this soup is a slice of fresh bread with butter or jam. It makes a wonderful home style meal! Such a comforting cozy classic! Place chicken and 2 cups chicken broth in a slow cooker and cook on low heat 4 hours. Remove chicken from slow cooker, set aside. Strain broth from slow cooker through a fine strainer into a bowl, set aside. Heat olive oil in a large pot over medium heat. Add carrots, celery, onion and garlic. Saute 3 - 4 minutes until slightly tender. Add remaining chicken broth and reserved chicken broth (that was set aside). Stir in parsley, thyme, nutmeg, and lemon juice. Bring soup to a boil over medium high heat. Once it reaches a boil reduce heat slightly and stir in Rotini noodles. Cook until noodles reach desired tenderness, about 10 - 12 minutes. Meanwhile, shred chicken then add to soup once noodles are cooked through. Season soup with salt and pepper to taste. Serve warm with optional cheese, crackers or fresh bread. Annie: Hi. I love your website! Thanks for sharing your expertise with the rest of us amateurs. I’m just wondering if I could use something else besides a crock pot for this recipe. I’m looking for a faster alternative. Wow, your blog is gorgeous and delicious! The noodle soup really sounds amazing!